The impact was immediate and massive. In a second the fireball of flame, earth and smoke spread almost four and half miles wide, engulfing everything within its path, visible over 250 miles away. After one minute the atomic mushroom cloud reached 47,000 feet high and 7 miles wide.? 5 ships were destroyed, numerous islanders were poisoned by the nuclear fallout, and a whole island was gouged out of existence as a crater 2km wide and 250 feet deep was burned into the earth. 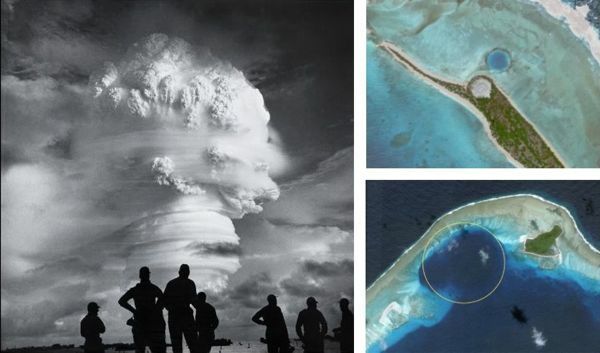 It was the 15 megaton 1952 ‘Castle Bravo’ atomic bomb test on Bikini atoll in the Marshall islands, 1200 times more powerful than the atmospheric bombs dropped on Hiroshima and Nagasaki, 1000 times more powerful than the Trinity test of 1945 that opened the floodgates to the nuclear world. 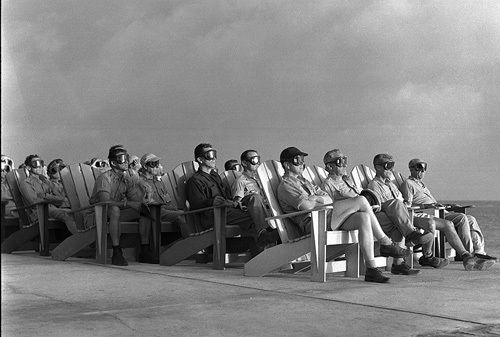 Enewak atoll capped to contain the radioactivity, islanders take to their deck chairs to watch, the mushroom cloud rises. There are four types of nuclear explosion: underground, underwater, atmospheric, and exo-atmospheric. 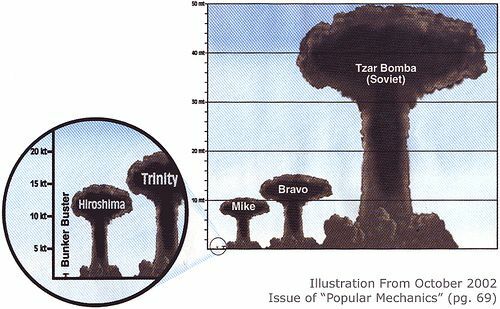 Hiroshima, Trinity, Mike, Bravo, Tsar Bomba. The first ever nuclear test was atmospheric, code-named ‘Trinity’ by the experiment leader J. Robert Oppenheimer after a line from an obscure John Donne poem, referencing the ‘three person’d God’. It was equivalent to an explosion of around 20 kilotons of TNT. A few weeks after that first test, similar devices were dropped on the Japanese cities of Nagasaki and Hiroshima. A tower for lowering the bomb, the bomb site from above, crowds watch the cloud rise. 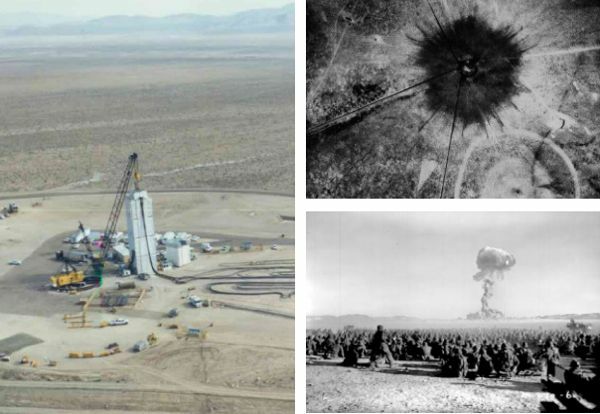 Tests in the deserts of Nevada were moved underground since 1962, and have continued until the present day, with 926 of 1021 of the US’s nuclear tests conducted there. 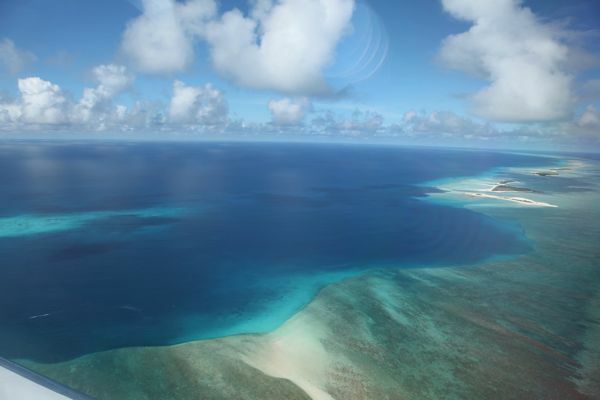 126 tests were conducted elsewhere, many at the Pacific Proving Grounds in the Marshall Islands. Underground tests leave ‘subsidence craters’ which are clearly visible from the air. 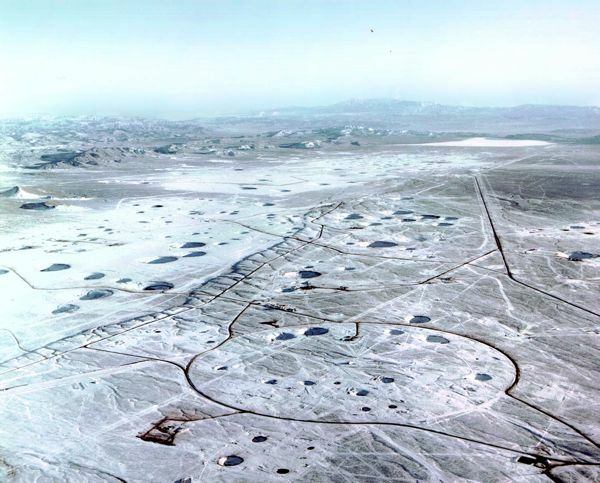 100’s of Subsidence craters at the Nevada Test Site. The second largest nuclear test ever commissioned by the US was nick-named Ivy Mike, the first ever test of a nuclear blast fuelled partially by nuclear fusion. It was 62 tons in weight and far too large to weaponize, resembling a factory more than a missile. The Russians referred to it mockingly as a “thermonuclear installation”. The test was carried out on November 1, 1952; it produced a yield estimated in the range of 10.4–12 Megatons. The fireball was approximately 3.25 miles wide, and the mushroom cloud rose to an altitude of 57,000 feet in less than 90 seconds. One minute later it had reached 108,000 feet, before stabilizing at 136,000 feet with the top eventually spreading out to a diameter of 100 miles with a stem 20 miles wide. 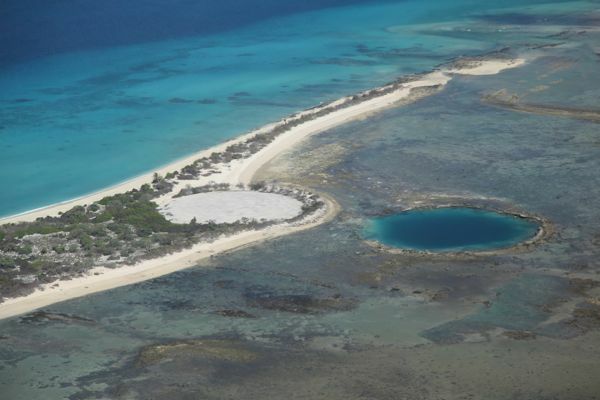 The blast created a crater 6,240 feet in diameter and 164 feet deep where the islet of Elugelab had once been; the blast and water waves from the explosion (some waves up to twenty feet high) stripped the test islands clean of vegetation, as observed by a helicopter survey within 60 minutes after the test, by which time the mushroom cloud and steam had been blown away. Irradiated coral debris fell upon ships stationed 30 miles from the blast, and the immediate area around the atoll was heavily contaminated for some time. 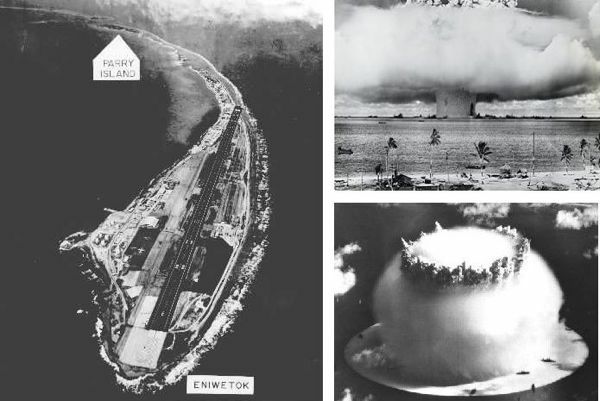 The blast on Enewetak atoll. 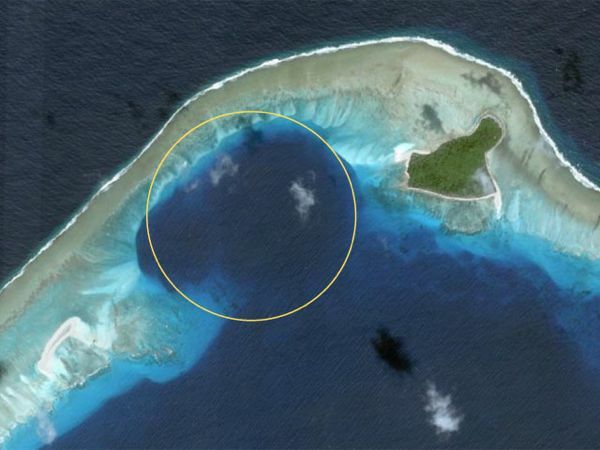 Radioactive debris from this test and others on the nearby Bikini and Rongelop Atolls were buried in the blast crater of the 1958 ‘Cactus Test’. 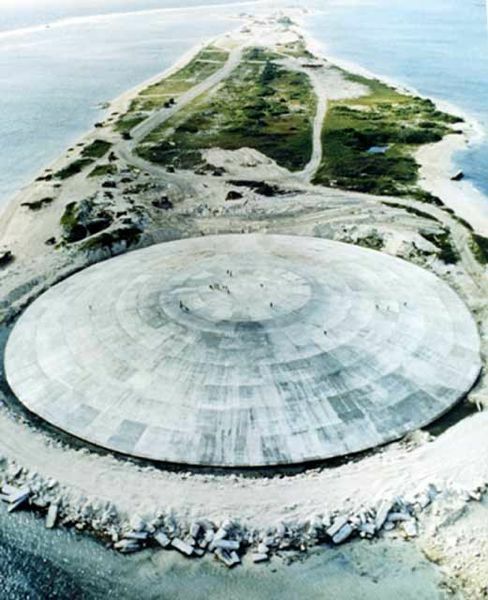 The concrete cap was built between 1977 and 1980 at a cost of $239 million. The crater beneath the dome is 30-foot deep and 307-foot wide. The crater capped with the ‘Cactus Dome’. 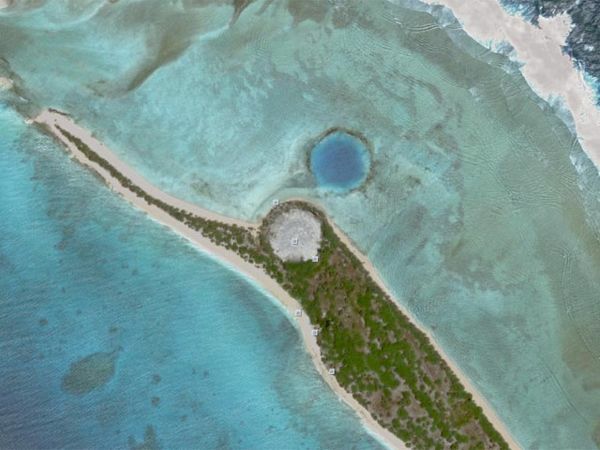 The Cactus Dome alongside an underwater crater of another nuclear test. From a helicopter taking star-gazers to a beach by the Dome to watch the recent total eclipse. The largest nuclear test ever conducted by the US in 1954, code-named Castle Bravo. 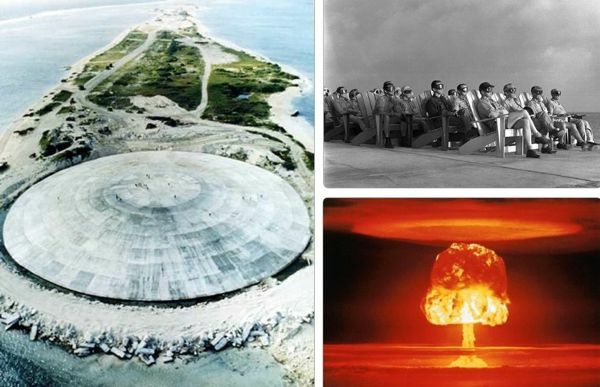 It blew a hole clean through the atoll it was tested on, with a yield of 15 megatons, 3 times more powerful than researchers had expected due to a mistake in the lab about the potency of ‘lithium-7’. This enormous error led to shockwaves and a degree of radioactive fallout they had not anticipated, poisoning the islanders who had been relocated to a ‘safe distance’, as well as crew of a Japanese fishing vessel in nearby waters, the ‘Lucky Dragon Number 5’. Personnel involved in the testing were also exposed to higher levels of radiation than expected, and many grew ill. The exposure of Japanese citizens to radiation from Us nuclear blasts for a third time prompted strong calls for the abolition of atmospheric testing. The blast, Castle Bravo crater. Islanders, personnel gathered to watch. Hole blasted in the island. Difficult to see, but the remains from the eclipse helicopter. 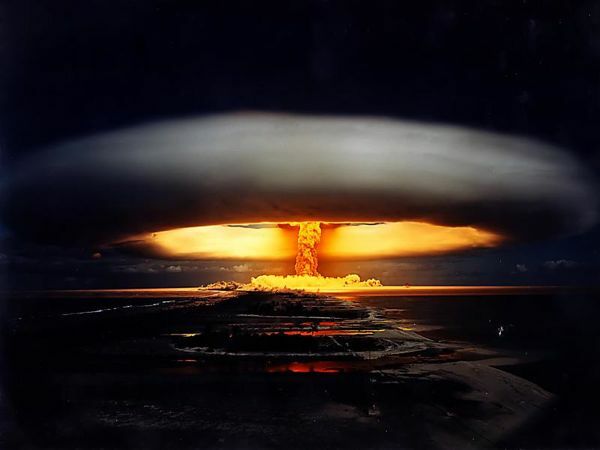 The largest nuclear test ever, the largest man-made explosion in human history, was conducted by the Russians, known as Tsar Bomba, and it dwarfed all previous tests by a factor of 3. It had a yield of 57 megatons, the equivalent of 10 times all the explosives detonated during World war 2, including both of the nuclear devices dropped on Nagasaki and Hiroshima, ‘Fat Man’, and ‘Little Boy’. Tsar Bomba, the largest explosive in human history. The Tsar Bomba (also named ‘Big Ivan’) fireball reached nearly as high as the altitude of the release plane, and was seen and felt almost 1,000 kilometres from ground zero. The heat from the explosion could have caused third degree burns at a range of 100 km. The subsequent mushroom cloud was about 64 kilometres high (nearly seven times higher than Mount Everest) and 40 kilometres wide. The explosion could be seen and felt in Finland, breaking windows there and in Sweden. Atmospheric focusing caused blast damage up to 1,000 kilometers away. The seismic shock created by the detonation was measurable even on its third passage around the Earth. The energy yield was around 7.1 on the Richter scale , but since the bomb was detonated in air rather than underground, most of the energy was not converted to seismic waves. The Tsar Bomba, or, ‘How I learned to stop worrying and love the bomb’. About 6 years back I went to the Hiroshima Peace Park. I saw the Atomic Dome, the sole standing reminder of what happened when the Enola Gay dropped ‘Little Boy’. I went in the Museum and emerged sickened by the detailed imagery inside, as almost everyone who goes there is. The physical marks these bombs leave behind serve to warn us of their massive power to destroy and tear asunder real lives. They are ruins that reflect our reality back at us. Sobering. A very interesting history article. Small correction: the US hasn’t tested any nuclear weapons underground or elsewhere since 1992 , . David- Thanks for correction, failed in my research there. One of the Castle Bravo photo craters looked familiar. Indeed, it’s Molokini Inlet, off the coast of Maui, HI, and has nothing whatsoever to do with nuclear testing. Dave- Thanks for the correction, I wonder if the source I drew this from knew that, or if he was fooled too. 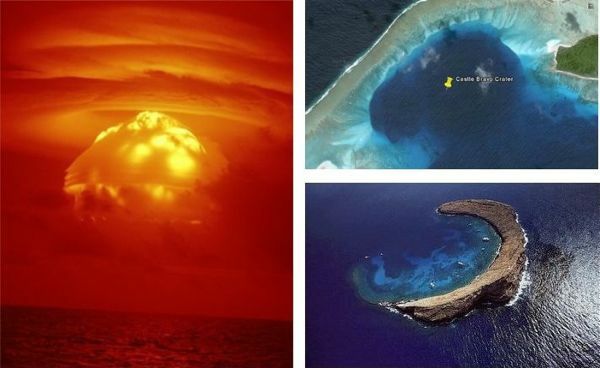 The ‘Castle Bravo’ crater you are showing is actually.., Molokini.., off of Maui in Hawaii. Also, the photo of ‘Tzar Bomba’ is not so. This is a nightime nuclear test on Bikini in the early 50’s as well. Your poor use of photos discredits your entire site. The photograph you have picture that is supposedly the Tzar Bomba is not. It is a French nuclear test from the late 1960’s or early 1970’s. You can see an island or series of small islands that track from the explosion to the foreground and ocean around. I find the comments every bit as interesting as the photography and articles. I am in love with this site. I was there. I stood as the fallout fell all around. I have tongue cancer and lost part of my eye sight from flash. My tongue cancer claim is currently under appeal. I worked on ten tests in the Pacific Proving Grounds and Nevada Proving grounds. It was a splendid time in my young life. I am now eighty. The spy’s for Russia caused this testing, but the Russians beat us anyway to the bigger blast. We were different then. Now pissants throw rocks at us and blow themselves up and spend our taxpayers money acting like children. Well Don, that must have been quite the experience back in the days and sorry to hear about your illness. Hopefully you will win your appeal, and the world will never have to witness one of these things going off in there neighborhood anytime in the future. Nice to read a post from someone that was actually there. I was on eniwetak in 1958/59 during the testing the other 4 people there with me are all deceased from some type of cancer.so far i am ok just getting old.hope i never have to witness thiese test again any one would like to contact me that was there during operation this operation would like to hear from you. This post is loaded with inaccurate descriptions and images. Volcanic structures and “islanders” in chairs to view the event is so incredibly irresponsible. Instead of saying “oops” for your mistakes, fix them. It is actually the “Licorne” test of the TN60 at Fangataufa ion July 3rd 1970. And not the Tsar bomba test. I was stationed at the Kwajalein NAS during the year 1958 as part of the support buildup for Operation Hardtack. I have Multiple Myeloma; a cancer of the blood which has no cure. This cancer is one of those sited by the U. S. Government that could be caused by downwind exposure. However, they do not consider those of us who were on Kwajalein Atoll eligble to the Downwind Exposure Compensation. Typical government logic. The planes we sent to the area for security had to be parked in a remote end of the island until they has been washed and scrubbed down. ????? gilbert Islands which is a municipality of the Marshall Islands.